1 of 2 Melt 3 tbsp of the butter in a large skillet over medium heat. Add onion and cook, stirring, 3 minutes. Stir in garlic; cook 2 minutes. Add wine and farro; cook 1 minute or until most of the wine evaporates. Transfer to slow cooker. 2 of 2 Stir in vegetable stock, pumpkin, 4 tbsp of the Parmesan and the sage. Cover and cook on HIGH for 4 hours. Uncover and gently stir in peas, remaining 1 tbsp butter, the salt and pepper. 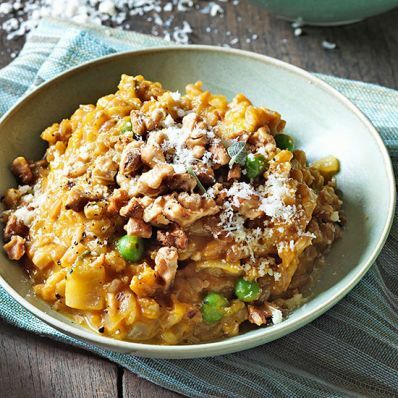 Spoon into bowls and top with walnuts and remaining 2 tbsp Parmesan.